God's handiwork, which I can visit, own and see: I need no copy of it from a human hand. However, there's one part of painter's art can please me: That piece which lays its hand to slow the wheel of time, And places the grandfather of my father's sire Now in my sight, as if he lived today or yesterday And allows the children of my grandchildren to inherit The countenance that goes with me to death and to decay. Is painter's skill not more the master than is time? Preserving in its oil these perishable things. Constintijn Huyghens, 1656 Constintijn Huygens was a major cultural and political figure of the Dutch golden age. An ambitious diplomat, Huygens was an influential secretary to successive stadtholders, the highest-ranking officials of the Dutch Republic. He was also a composer and a poet, whose work holds a significant place in the history of Dutch music and literature to this day. His poetry, written in French, Latin and Dutch, ranges from pastoral songs to religious sonnets and many odes to art and artists. A scene from the stage or the pub? 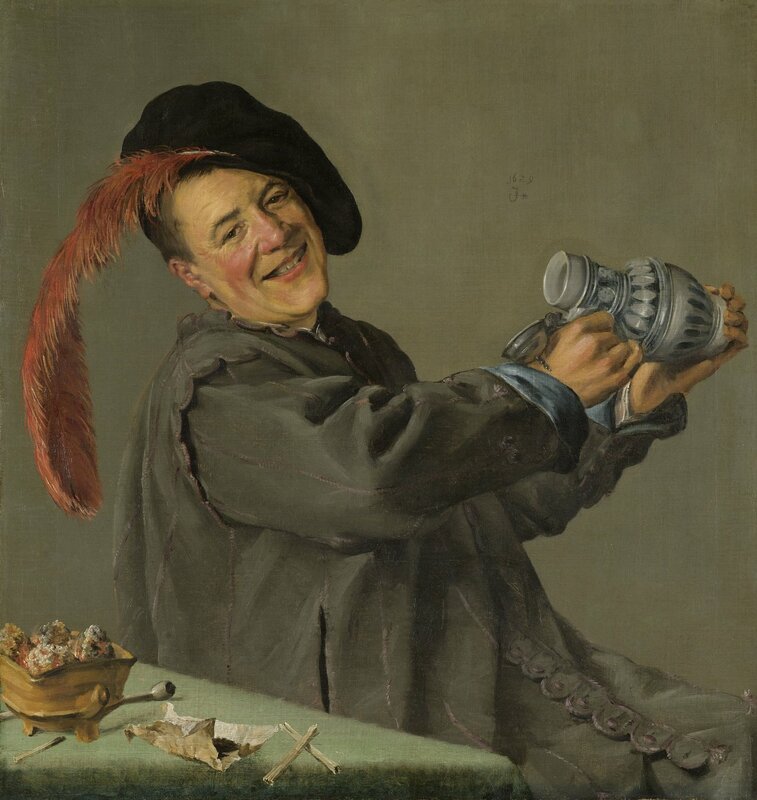 At first glance, Judith Leyster’s Jolly drinker could be any reveller found in a seventeenth century Dutch tavern. 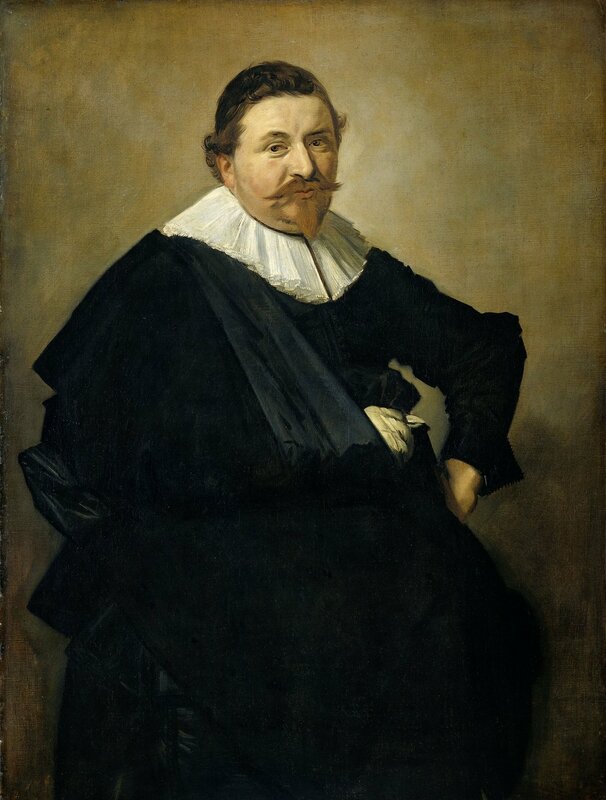 But the sitter’s theatrical costume, sporting a flamboyant red plume, identifies him as Peeckelharing or ‘Pickled herring’, a comic character from the Dutch stage. Peeckelharing was known for his debauchery and cheeky behaviour. Here, he tips up his beer tankard, yet his flushed cheeks and cheery grin suggest he’s probably already had a few! His smoking paraphernalia - including a brazier with glowing coals, tobacco in a paper wrapper and little rolled sticks of paper for lighting the pipe - are scattered across the table before him. On the wall, just above the jolly drinker’s tankard is the artist’s signature – a monogram of JL and a little star. This was a play on words as "Leyster" means "Lode star" in Dutch. And for Dutch mariners of the time lode star was the common name for the guiding North Star. About Judith Leyster Judith Leyster - the brilliant student of Frans Hals - is one of the most celebrated artists of this time. As a versatile painter, she adapted her style to the subject at hand, whether a pensive musician, drunken reveller or refined middle-class citizen. She is among the few female painters of the time. Like most careers outside the home and family businesses, the painter’s profession was not open to many women in the seventeenth century. 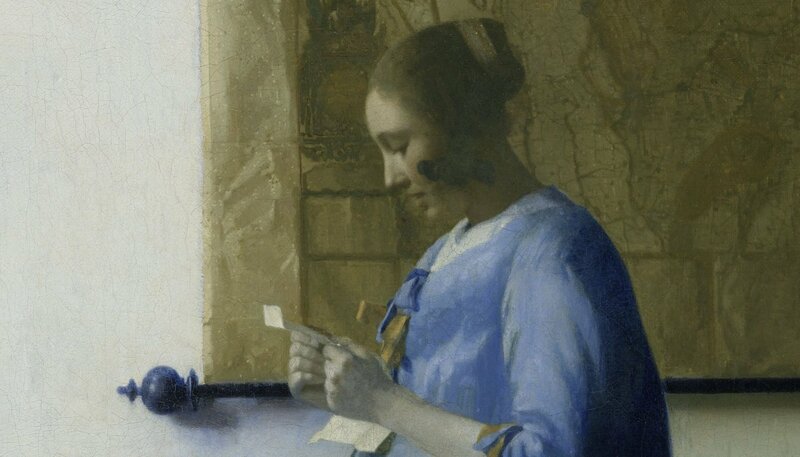 For unknown reasons, Leyster seems to have abandoned painting when she married in 1636 and today only 20 of her paintings are thought to exist, making her work even rarer than Vermeer’s. The United Provinces are the envy of some, the fear of others and the wonder of all their neighbours. Like many Australians, I grew up with reproductions of paintings hanging in the family home. As a child, we don’t really understand where these images come from or what they represent, but they become familiar fixtures to us. They become part of our childhood memories of home. And then later in life, you might eventually stumble on the real thing in a museum. This can be an extraordinary moment. Growing up in our small house in Canberra, we had reproductions of a Maurice Utrillo over the fireplace and a little painting by Robert Campin from the National Gallery in London. My dad travelled for work, so perhaps he bought them in London or was given them as a gift. I also remember an image of a small Dutch painting of people having a drink in the backyard on a sunny day. A few years ago, I came across an old family photo of my parents on the sofa with this print above them on the wall. 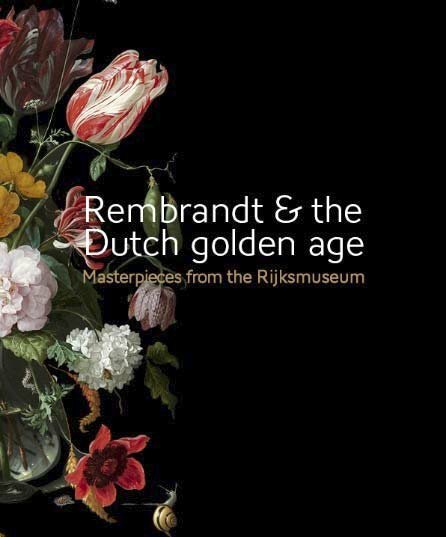 During one of my visits to the Rijksmuseum in preparation for this exhibition, I was walking through the coveted ‘Gallery of Honour’ where the museum hangs its star paintings from the golden age of Dutch art. And there it was – the same painting that had hung in reproduction above my parents’ sofa all those years ago, Pieter de Hooch’s 'Three women and a man in a yard behind a house', c1663-65. It was such a fabulous painting—and uncanny to see it in the flesh when I knew it so well from my childhood home. I’m so pleased that the Rijksmuseum so generously agreed to lend us this precious painting. de Hooch’s painting, and so many of the Dutch masterpieces from this time, are remarkable to this day in that they continue to be relatable. Maybe it’s because they are scenes of simple, everyday pleasures, rather than high-minded, complex literary or historical stories. 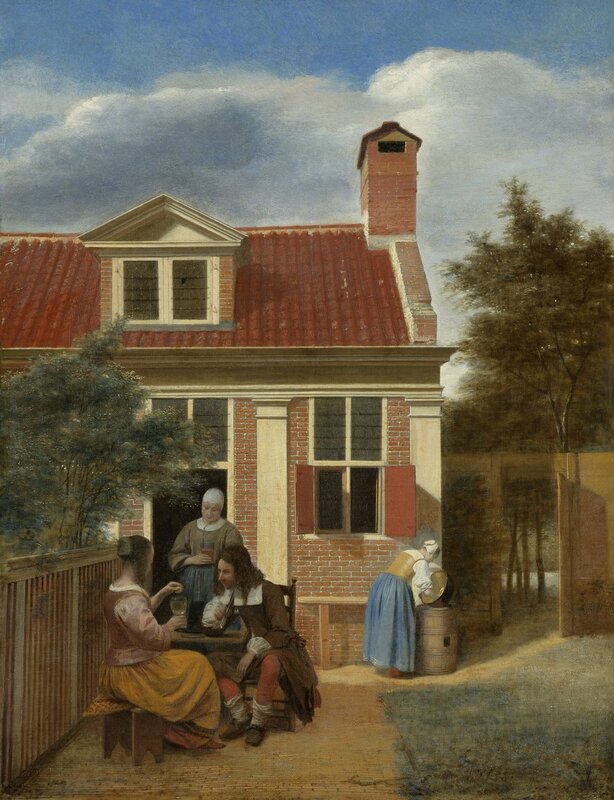 The subject of the de Hooch certainly resonates with the Australian lifestyle today—a relaxed, social scene of drinking in the sun in the backyard.